Coach Art Briles' Baylor Bears shared the Big 12 title with TCU, and beat the Horned Frogs head-to-head. 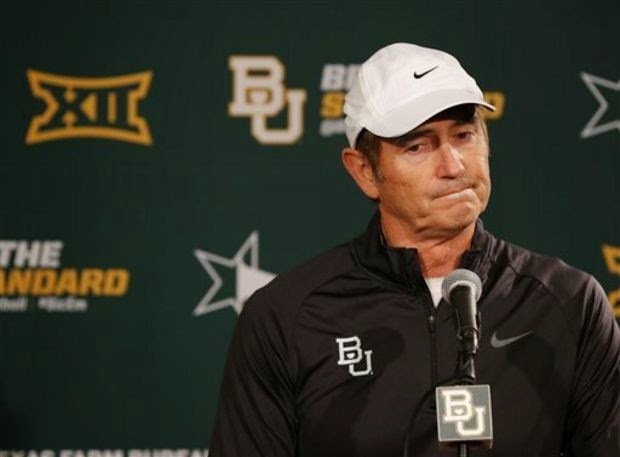 Still, like TCU, Baylor was left out in the cold by the College Football Playoff Committee. The nation’s top six teams all had a lot to prove on championship weekend. Unfortunately for the CFP committee, they all proved themselves admirably. When the dust settled, a pool of six deserving teams remained, from which the committee needed to choose four. Alabama, Oregon, Florida State and Ohio State qualified, while Baylor and TCU, the Big 12 co-champions, did not. The most baffling aspect of the committee’s decision was how it handled TCU. The Horned Frogs, ranked 3rd heading into the weekend, demolished Iowa State 55-3. They couldn’t have played a more complete game, yet they fell from 3rd to 6th in the final CFP rankings. This was the committee’s clearest indication that it operates differently from past ranking systems. No premier team would see a significant dip in its AP ranking after a convincing win. But, as bizarre as TCU’s drop seemed at first glance, the committee did have sound reasoning behind its decision. First of all, TCU had no room to move up. No. 1 Alabama routed No. 16 Missouri 42-13 to win the SEC championship and No. 2 Oregon obliterated No. 7 Arizona in the Pac-12 Championship Game. Despite the dominant nature of TCU’s win, it came against a 2-10 Iowa State team that did not win a single game in conference play this year. Meanwhile, No. 4 Florida State notched its best win of the year, defeating No. 11 Georgia Tech 37-35. Though the game was extremely close, it extended the Seminoles’ unbeaten run and bolstered the strength of their schedule. Florida State was the only Top-6 team that failed to cover the spread this weekend, so in that sense, it did not warrant a rise in the rankings. But the Noles are still undefeated defending national champions, which is enough to earn them a playoff spot. No. 5 Ohio State also made some serious noise on Saturday. The Buckeyes came into the Big Ten Championship as a 4-point underdog against No. 13 Wisconsin. They held the nation’s best running back, Melvin Gordon, to just 76 yards and no touchdowns on 26 carries. Behind third-string quarterback Cardale Jones, they scored more points in the first half (38) than Wisconsin had allowed in any game over the previous three seasons. Jones made history by being the only quarterback to make his debut in a Power 5 conference championship game, and he thoroughly exceeded expectations. Not only did the Buckeyes record the first ever shutout in a Power 5 conference championship game, but their offense continued to pour on the points in the second half of a merciless 59-0 annihilation of the Badgers. Those championship victories over Top-15 teams impressed the committee enough to move Florida State and Ohio State up to 3rd and 4th place, respectively, which rounded out the final playoff selections and left TCU out. Another point of contention for the committee had been its decision to consistently rank TCU ahead of Big 12 rival Baylor despite Baylor’s 61-58 win against TCU in October. By beating No. 9 Kansas State 38-27 on Saturday, Baylor’s strength of schedule finally compared well enough with TCU’s that the head-to-head win came into play. Baylor leapfrogged the Horned Frogs to finish 5th. The process that led to these final rankings made it abundantly clear that very little separated these six teams. The committee members handled an impossible decision as well as they could have. Unfortunately, two strong teams needed to be left out. According to ESPN Stats & Info, TCU and Baylor would each be favored by at least a touchdown if they were to play Florida State. They might be better than the Seminoles, but they did not match Florida State’s undefeated record, and their status as conference co-champions likely diluted the significance of their achievements compared to the other four undisputed conference champions. The new CFP system is a definite improvement over the BCS, which would have selected Alabama and Florida State for the national championship game and left Oregon and Ohio State out. But a four-team playoff is still not enough. With five major conferences, the playoff must have at least five spots, and an eight-team playoff would be ideal. This year, there would have been very little debate that the current Top-6 teams would qualify, along with Mississippi State and Michigan State. An eight-team system would allow two excellent teams from the same conference to both compete for a national title. Instead, the only conference that featured two contenders this year was left out of the playoff entirely.